Introduction — A Scientific-Philosophical View of Methodology (K.H. Wolf, G.V. Chilingarian). 1. Diagenetic Processes in Northwestern Gulf of Mexico Sediments (J.M. Sharp et al). Introduction. Genesis of the Gulf of Mexico Basin. Geothermics and hydrodynamics of the system. Formation waters. Evaporites. Mesozoic rocks. Cenozoic sediments and rocks. Concluding statement. 2. Ferromagnesian and Metalliferous Pelagic Clay Minerals in Oceanic Sediments (S. Yamamoto). Introduction. Mineralogy and chemistry of oceanic sediments. Correlation between Fe and Mg in deep-sea sediments. Ferromagnesian clay mineralogy and clay mineralization in the deep-sea. Concentration processes of heavy metals in deep-sea sediments. Recognition of deep-sea sedimentary rocks through Fe/Mg ratios. Summary and conclusions. 3. Diagenetic Transformations of Minerals as Exemplified by Zeolites and Silica Minerals — A Japanese View (A. Iijima). Part I. Zeolitic diagenesis. Introduction. Genetic types of zeolite occurrence. Burial diagenesis (or burial metamorphism). Submarine hydrothermal and diagenetic alteration. Contact metamorphism and burial diagenesis. Mineralogy of diagenetic zeolites. Petrochemical aspects of zeolitization of vitric tuff. Part II. Silica diagenesis. Introduction. Silica phases in fine-grained siliceous rocks. Burial diagenesis in subsurface sections. Later diagenesis in surface sections of Neogene siliceous rocks. Preservation of siliceous organic remains. Experimental silica diagenesis. 4. Authigenic Green Particles from Marine Environments (G.S. Odin, A.C. Morton). Introduction. Physical properties. Mineralogy and chemistry. Verdissement process. Occurrence and paleogeographic significance of green particles. Conclusions. Subject Index. 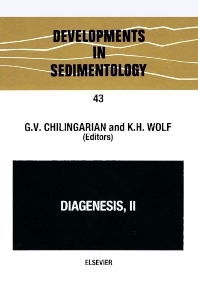 Diagenesis is a highly developed, interdisciplinary field of study. It is reciprocal in that it borrows from numerous scientific or technological specialities and then, in turn, repays them with useful results. Too often, however, the information gained and concepts developed remain unintegrated instead of being utilized quickly by several related earth-science fraternities. This volume, the second of a multi-volume work, attempts to bring together such information, thereby assisting the individual and the research group in keeping up with the data explosion. There is no end in sight to diagenetic research because of its wide practical and intellectual appeals. Consequently, periodic reviews, such as presented in this volume, are greatly needed.